A sentence commutation can be granted by the President of the United States in federal criminal cases or the Governor in state cases. The prisoner must complete a sentence commutation petition before commutation will be considered. The federal government and each state typically have their own version of a sentence commutation form. A sentence commutation, if granted, reduces a prisoner's period of incarceration. A sentence commutation does not imply forgiveness of the offense, has no effect on the underlying conviction, and does not necessarily reflect on the fairness of the initial sentence imposed. A sentence commutation typically will not be granted (i) unless the prisoner has exhausted his or her court challenges to the conviction and sentence, and (ii) the prisoner has begun serving the sentence imposed. In federal cases, the President may also impose conditions as part of a sentence commutation grant. What Is The Standard For Deciding A Sentence Commutation? Any other factors relevant to commutation of a sentence. How Long Does It Take To Receive A Sentence Commutation? It can take months, sometimes years, before a sentence commutation is granted or denied. This is largely because of the lengthy process for reviewing each sentence commutation request. What is the Sentence Commutation Process? 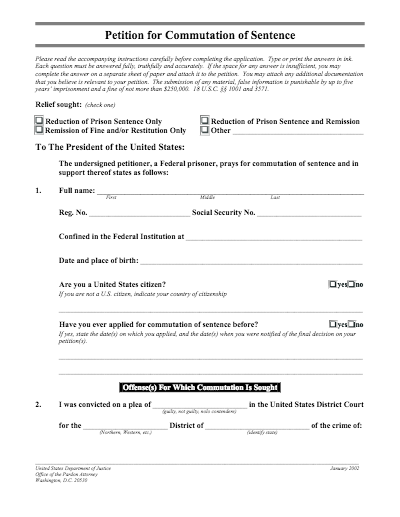 In federal cases, a petition for sentence commutation is first sent to the United States Office of the Pardon Attorney (OPA). Upon receiving the petition, the OPA carefully reviews the entire application and begins an investigation. As part of the investigation, the OPA may request information from other federal agencies. Such requests may take time if information and documentation has been archived. Once all of the relevant information is received, the OPA prepares a recommendation that goes to the Deputy Attorney General. The Deputy Attorney General, in turn, determines whether the OPA recommendation should be included in the U.S. Justice Department's overall recommendation to the President of the United States. The President then determines whether, and when, to act on the Justice Department's recommendation. It is the OPA's long-standing policy to avoid giving a petitioner any information about the status of a particular sentence commutation petition until the process is concluded. After the President makes a decision on a sentence commutation petition, the OPA notifies the petitioner in writing. In state cases, the rules, timeline, and processes will be dictated by the specific laws of the relevant state. That said, the state sentence commutation process is generally similar to the federal process described above. To give context to this discussion, some examples may help. Let's take a look at two high-profile federal sentence commutations under two different presidents. Building on the discussion of Chelsea Manning above, it appears that many of the relevant standards for sentence commutation existed in her case. As noted, Chelsea Manning leaked classified information and was ultimately sentenced to 35 years in prison. In January 2017, President Obama commuted her sentence after she served seven years in prison. Applying the commutation standards to Manning's case, it is clear that Manning's sentence was unduly severe given that it was, by far, the longest sentence in the U.S. for such a crime. In addition, Manning was born a male. However, Manning identified as female, and she announced that she would be called "Chelsea" rather than "Bradley" at the time she was sentenced. Despite that declaration, Manning was imprisoned in a male military prison facility, and she tried to commit suicide on more than one occasion. Thus, the factors of "critical illness" and/or "nature of adjustment to prison" could indirectly apply to the emotional problems Manning was facing. Moreover, when compared to the leak perpetrated by Edward Snowden, it is accepted that Manning's leak was not as serious and did not cause harm to the U.S. Taking all of the above into account, coupled with the fact that Manning served seven years of her sentence, it appears that many of commutation standards leaned in favor of commuting her sentence. In July 2007, President George W. Bush commuted I. Lewis "Scooter" Libby Jr.'s 30-month sentence for committing perjury and obstruction of justice. Scooter Libby was convicted on those charges in connection with the leak of a C.I.A. agent's name, which put that agent in serious danger. President Bush commuted the prison sentence before Libby began serving the prison term, citing the sentence as "excessive." In applying the commutation standards here, the sentence of 30 months was not unduly severe. Libby did not suffer from a critical illness or old age. Libby's work as chief of staff to the Vice President could be considered meritorious service to the government, yet such service was adequately rewarded in terms of prestige. Finally, the leak of the C.I.A. agent's name was very serious because it put that agent's life at risk. Thus, lying to law enforcement about the leak can be considered serious. Accordingly, the standards relevant to commutation do not appear to lean as heavily in favor of commutation in Libby's case as they did in Manning's case. Sentence commutation, on either the federal or state level, is a form of executive clemency that allows mercy to be given typically to a person who is already serving a prison sentence. The lengthy commutation process is guided by standards that take into account all of the circumstances surrounding a petitioner, including the seriousness of the offense and the severity of the sentence. Be sure to check out other articles on https://clemency.com for information on other forms of executive clemency. If you or a loved one is interested in applying for a sentence commutation, feel free to request a free initial consultation from attorney Brandon Sample. You can request a consultation by submitting a free consultation request form, or by calling 802-444-4357.